Week 9 Waiver Wire Picks: Megatron Returns? This is going to be a strange week for pickups. Halloween is bringing out fantasy zombies at every turn. The week 9 waiver wire is seeing speculation run rampant, but which risks make sense? I'll give you my opinion of how to navigate this labyrinth of false hope. Expectations for the Jets are being exceeded at every turn this season. The quarterback looked like a black hole for New York, but McCown has been very good (for fantasy anyway). There have been two games all season where McCown has scored less than 15 fantasy points. In addition, he has topped 20 points in each of the last three weeks. He is not matchup proof, but McCown is a great bye week play. The former understudy to Tom Brady has flashed good things in limited playing time. The same could be said of Matt Cassel at one time though. At the very least, Garoppolo is going to be a great pickup for two QB leagues. I think that he will be more than that, but it may take time. Getting acquainted with a whole new offense may take the rest of the season. He is a great hold for dynasty leagues, but Garoppolo is risky for redraft. The veteran starter has looked washed up at times this year, but Manning has had little to work with. Now Evan Engram is emerging as a legitimate receiving threat. In addition, it looks like Sterling Shepard will return from injury this week. With a couple of legit weapons, the Giants head into a few less than daunting matchups. If Manning is going to make a resurgence this season, now would be the time. Collins has been incredibly effective. Go get him if he is available in your league. A little known back for the Ravens is getting ready to make a big name for himself. Collins has been scintillating on limited carries so far in 2017. Running at a clip of 6.0 yards per carry, Collins just ripped off 113 yards on the Dolphins. Coach Harbaugh said that the Ravens are going to give Collins significantly more work going forward. That makes sense given the huge disappointments that his other running backs have been. Collins is a solid RB2 at the moment. Nobody is here to read legal nonsense, so let's boil it down to facts. Elliott is suspended right now, but can still appeal. For the moment, McFadden or Morris will start but that could change by Sunday. If you do not have the bench space then stay out of this nonsense. For those that want a piece of the Cowboys run game, I recommend fantasy zombie Darren McFadden but not if you have to break the bank. There should still be some value to Morris; neither of these guys will get all of the touches. There have been rumblings about the Colts possibly moving Frank Gore before the deadline. That would GREATLY increase Mack's value. Even if Gore stays put, it is clear that the Colts are committed to getting the rookie his touches. Unfortunately, they are not worth as much as if they were for a better team. Still, Mack is going to be worth a flex play most weeks at a minimum. It is still impossible to tell from week to week which Patriots back will have value. One thing is for sure though, Mike Gillislee has fallen out of favor. With Burkhead back from injury, it is a solid bet that he will be worked into the rotation. He had 7 catches for 68 yards last week and that kind of return gives him major value. It goes without saying that he is more of a factor in ppr formats. It looks like Woodhead should be ready to return when he is eligible in week 11. He is getting ready to return to practice and that means that he should be on track with his recovery. 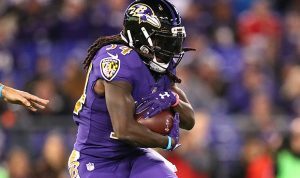 This does not hurt Alex Collins value, as he is almost solely a rushing threat. Woodhead will probably render Buck Allen completely obsolete, though. If you have the space to stash, Woodhead could be a difference maker down the stretch. The Steelers were not exactly missing Martavis Bryant on Sunday night. Smith-Schuster burst onto the national scene with a huge 7 catches 193 yards and a touchdown. The rookie seems to have a great rapport with Ben Roethlisberger and complements Antonio Brown well. There is reason to believe that going forward he will continue to be an explosive big play threat. Oh, and he is also the youngest player in the NFL. The Seahawks were in a shootout with the Texans in their last game so there were inflated numbers. Richardson was one of the beneficiaries of this, as he went over 100 yards and scored twice. Still, he caught another touchdown pass the week before and has the trust of Russell Wilson. This is traditionally the time of year when Wilson catches fire and takes the rest of the offense along for the ride. It could be a big end of the year for Richardson if Wilson keeps looking his way. So far it has not been a lucrative practice to own Dolphins in 2017. Stills is at least seeing a steady stream of targets, however. The last three games have seen Stills catch 4, 6 and 5 passes respectively. That has been with two different starting quarterbacks as well. In addition to seeing a nice target share, Stills is a big play threat. He has a sneaky high weekly ceiling. 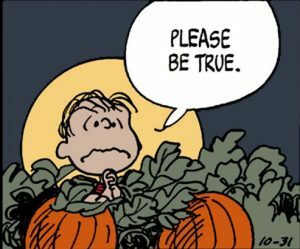 Will Megatron rise from the pumpkin patch, or leave you sad and without candy? When it comes to targets, Jacoby Brissett only has eyes for Doyle many times. This has been the downfall of T.Y. Hilton in 2017, but could benefit your fantasy team. In 5 of the last 7 games, Doyle has had at least 5 catches. This has not always led to huge yardage totals, but the potential is certainly there. When it comes to tight ends that is about as much as you can ask for. The Falcons' young tight end does not always see enough targets, but when he does he produces. Last week he caught four balls for 47 yards and a score. If Matt Ryan were playing a bit better this would be expected a bit more often. As it is, Hooper is sort of a coin flip. Get out and hit the waiver wire while there is still time. It is a spooky mess with ghosts of fantasy past rising up to eat your team's brains. Be careful which ones you let into your roster or you will surely be lost. Check back every day for more exclusive fantasy content. As always, follow us on Twitter: @_knuckleheads and @brendancole16. Category - The Best Waiver Wire Picks - Week 9 Waiver Wire Picks: Megatron Returns?